Welcome to Steak 101 by Sizzler, where we cover all things steak-related to not only get you salivating and wanting to come into our steakhouse in Phoenix or Mesa, but also to fill you in on the wonderful world of steak and how you can make steakhouse-quality meals right at home too! In this post, we’ll dive into some tips from the pros on what it takes to make a great steak, because, like we always say at Sizzler, not all steaks are created equal! So we’re here to let you in on some of the basics behind what separates a great steak from your typical, run-of-the-mill steaks. This is the first and most crucial step in crafting an authentic, steakhouse-quality steak. Take it from our steakhouse chefs, not all steaks are created equal! Grilling the perfect steak all begins with choosing the right beef for the job. Even the greatest steakhouse chefs can’t turn rubbery meat into a delicacy. Select: This is the lower quality of beef found in your average supermarket. Select beef, in general, is best suited for roasts rather than for grilling steak. Choice: As the name hints, Choice cuts of beef are more choice for grilling steaks and is what most high-quality steakhouses, including Sizzler, lean toward as the most popular and dependable meat, with tenderness and marbling perfect for grilling delectable slabs of steak. Prime: This is the highest quality of beef possible that is more difficult (and expensive) to come by. Only roughly 2 percent of beef meets this level of USDA grade. While they do offer the most marbling, texture, and profile, they will also cost you a pretty penny. If you are willing to put forth the extra investment for the perfect steak, Prime beef is for you. Of course, it goes without saying that choosing your cut of steak is as equally important of a factor in selecting the beef for grilling your steak. Filet: This is the most tender cut of beef around, but due to less marbling, it doesn’t quite have the same flavor profile as other cuts. Despite this, it is still regarded in the steakhouse world as a quality cut of beef. Ribeye: This is our personal favorite to craft (and eat) here at our Sizzler steakhouse in Phoenix — mostly because ribeyes are the most flavorful cut of steak. This is because of all the marbling inside that gives this cut its rich flavor, but ribeyes also are usually less tender due to this as well. Most people are either a filet or a ribeye type of person as they are the most differentiated cuts of steaks. Sirloin: This cut of beef offers a popular compromise between the tenderness of a filet and the juicy flavor of a ribeye, which is why it is our most popular option of steaks here at our Phoenix steakhouse. It’s a firm meat with good flavor and it can come in a variety of options, from Tri-Tip to T-bone, New York Strip, Flank, Porterhouse, and many more depending on which section of the beef is chosen. One thing that any steakhouse chef will tell you is that aged beef is not only more tender, but it is also much more flavorful. Aged beef comes in two primary forms: wet aged and dry aged. Wet Aged: This beef is aged by marinating in its own juices inside of a bag. You will find this method being used behind the scenes in a multitude of steakhouses as it is more cost-effective due to the fact that the beef does not lose as much mass as it can during dry aging. With that being said, a wet aged steak’s juiciness will knock the socks off any non-aged steak any day of the week. Many thinner steaks are also required to be wet aged as they simply don’t have the mass to be dry aged. If you attempt to dry age a flat iron steak, you’ll end up with a piece of beef jerky when you go to put it on the grill. Dry Aged: Think of dry aging the way you would think of wooden-barrel-aged whiskey. It’s the choice method of many master chefs and steak connoisseurs because it allows the steak to breathe while it slowly depletes its water and breaks down the beef, adding to its “beefiness.” With less water, tenderness is increased and you get more of a “gamey” flavor in each bite. If you are after a truly great, authentic steak, rule No. 1 of steakhouse chefs is to ditch all the extra exotic seasonings and stick to just these four: salt, pepper, butter, and olive oil — that’s it. Crafting a great steak is just like any other artistic masterpiece, you don’t want to overthink it. You want the natural flavors of the steak to come out and too much seasoning can easily mask this. You should begin your steak seasoning by mixing rock salt or gourmet sea salt (not table salt) with coarse ground pepper. Our steakhouse pro tip is to allow the meat to rest after applying the seasoning to both sides for at least 30 minutes prior to throwing on the grill. Why? This allows the steak to be brought up to room temperature so it then cooks evenly while also absorbing some of the flavors from the seasoning into the interior rather than just having an overly salty exterior. Grilling a perfect steak becomes a much simpler task once you learn how to properly sear your steaks. Most steakhouses have incredibly hot broilers that burn up to 1700 degrees in order to sear the outside of their steaks. When you’re grilling at home, you probably don’t have the luxury of using a 1700-degree broiler. However, you can still put a nice sear on your steak by using the right technique, which will not only give you a crispier outer crust to your steak, but will also lock in the flavors and juiciness of your steak rather than having them all drip out while you grill. As long as you can get your grill above 600 or so on your infrared, you should be able to give your steaks a good steakhouse-style searing. If your grill temperature can be inconsistent or hard to measure, get a pan really hot, coat your steaks with olive oil, and sear them for about 60 seconds a side. *Assure that you remove excess oil from the steaks after to prevent flare-ups on your grill. Before you even think about dropping your meat onto the grill, make sure that your grill is nice and hot, then immediately turn the temperature down a tad once you add the steaks. Many steakhouse chefs cook on an open-faced grill, for which you want to have a higher temperature, but with a standard household grill with a lid, you’ll want to keep your grill closed and run it at around 360 degrees. Temperature can certainly vary to an extent depending on each individual grill along with personal preference. If you are cooking a smaller portion of beef and have a grill with multiple burners, another pro tip is to turn your burners up a tad higher, but then move your meat to the portion of the grill away from the flame. This prevents flame flare-ups from unevenly cooking your steak. Another item that is common knowledge amongst many steakhouse chefs, which also plays a role in why your delicious steak can take time to perfect in our Phoenix steakhouse, is that your steak is not done cooking when you take it off the grill. Many steaks can be ruined by over-eager grillers who are ready to dig into their prize creations. By allowing your steak to rest for an extra five minutes after bringing it in from off the grill, the juices will be reabsorbed into the beef that were being squeezed out by the high temperatures of the grill, ensuring you get the juiciest first bite imaginable when you finally dig in. As you can see, grilling the perfect steak is a very complex task that requires a lot of perseverance and attention to detail, something we take pride in at Sizzler. 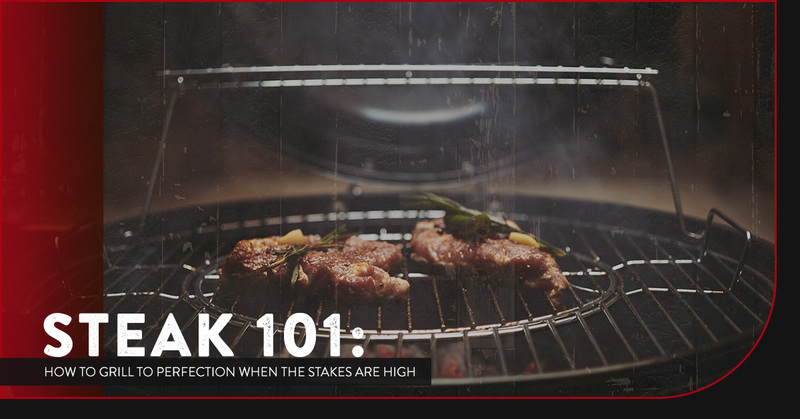 We hope that you will implement these pro tips from our steakhouse chefs when you go about perfecting your steak craft. If you aren’t in the mood to cook your own masterpiece, stop by our steakhouse in Phoenix or Mesa, Arizona, today to get some of the best steaks in town at unbeatable prices!